The Raiders and Lou Christie kept a Municipal Auditorium crowd in an uproar Saturday. The performance was stopped once, for the fans were storming the stage. The Raiders are some of the greatest entertainers teenagers ever could hope to know. Their antimated personalities are prevalent even off stage, and their wit seems genuine. Papa Paul, who was very tired, stayed secluded in the dressing room while the other Raiders roamed around backstage, but when he did come out he was the same Paul. FANG WAS in a good mood and talked and laughed with everybody. Marks hair has already grown two inches since he was here last, for he never gets it cut in the back. He is known for his good looking clothes and was the one who explained to the first audience the reason they didnt wear their traditional Revolutionary costumes. The new white suits had been sent to New York by mistake, but got here for the other shows. Harpo always came out of the dressing room early. He likes to mix with people and talk. The little man with the cowboy hat always seen rushing about the state is their road manager Hoss. He loves the Raiders and takes their teasing good-naturedly. Lou Christie feels his personality has changed since he has become famous. He can now accept people for he says he has seen everything. When asked where his favorite place to play is, he replied Birmingham. Patty Michaeals, the beautiful and talented female singer, put on a great performance. The Blues Magoos started in Greenwich Village 15 months ago with the help of the Lovin Spoonful. Even though they dress eccentrically, they are all nice, and quite funny. WVOKs Shower of Stars at Birmingham Municipal Auditorium Saturday turned out to be a deluge of talent with a roster of Top Tenners providing more than three hours of exciting entertainment. A packed house was on hand to greet the first act, Birminghams own Rocking Rebellions. Neither I, nor the audience, had ever seen anything quite comparable to the physical gyrations that accompanies the vocal gymnastics of one Roy Head. His flips and splits sent the audience into an ecstasy, shouting and hand clapping. 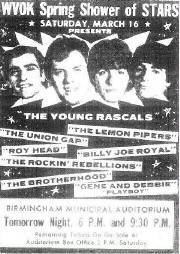 Billy Joe Royal, who seemed to get thinner, longer haired, more active and bigger voiced with every show, received a royal welcome from the crowd on this, his umpteenth appearance in Birmingham. The Union Gap was formally rebelized on the stage of the Auditorium, when they were made honorary members of the Alabama State Militia. THOUGH THE GROUP appeared as usual in their Yankee Uniforms, a Confederate flag graced the stage for the remainder of their performance. The colorfully costumed Brotherhood, real sweethearts, Gene and Debbie, and the Lemon Pipers of the Green Tambourine, added variety and luster to the evening. 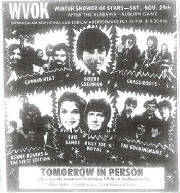 The last 45 minutes of the show were spent grooving with The Young Rascals. They lived up to their reputation of being top showmen. The foursome went through their repertoire of top hits with verve and assurance show toppers and show stoppers. It has been almost two years since they first came to Birmingham. Their showmanship was vastly improved, the selections become more varied. This combo really ranks with the best. Once again, the WVOK Shower of Stars hit Birmingham. What it turned out to be as no so much a show as a battle between them (the police) and us (the audience and performers combined). 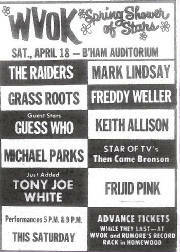 Headliners Saturday were mostly British imports..Hermans Hermits, The Troggs, The Buckinghams, and Four Jacks and A Jill. The Yankee element was supplied by Boyce and Hart, The Ohio Express, and the Pack. THE SHOW was marked by flying objects hurling at the stage constantly, thunderous explosions, agonizing screams, smoke, and the blinding psychedelic lighting. It matters little whether you have talent. All you need to succeed at the Shower of Stars is a solid wall of noise behind you and good looks. There wasnt an ugly performer on stage. Musical ability is nice but not really demanded. Headliners Hermans Hermits returned to Birmingham for the fourth time. They have a style all their own. But the two hours plus waiting for them to appear is another story. Hard rock can only be taken in small doses. AS THE TECHNICIANS set up for each act, it was obvious that they were adding more and more equipment. It gave the impression of a contest to see which group could be the loudest. Each group was purported to have their own sound but after a while it all ran together. The only exception was a refreshing appearance by Four Jacks and A Jill. A new group to this country, they have a light touch with their material, and they flavor it deliciously with the sounds of their country, the Union of South Africa. But the real treat is the audience. The scream, cry, claw at each other, hurl insults at the police and slavishly perform some of the last rites of idolatry left in the world today. For those interested, there will be another musical Dunkirk next weekend. The names may have been different, but the groans, wails, psychedelics, electronics and ecstasy were the same. The second segment of WVOKs Shower of Stars at Municipal Auditorium Saturday featured American performers in contrast to the concentration last week on British imports. Birminghams Rocking Rebellions opened Saturdays show, followed by The Majestrates and their current hit, Here Comes The Judge. Although Judge was done rather effectively, the group would benefit immensely if the girl singer would stand back from the mike about six inches. THE PEOPLE followed with an act composed of solid sound, enough lights to set the nerves screaming, and practically no talent. TO COMPENSATE for last weeks all group program, Saturdays featured three single performers. Billy Joe Royal, a disjointed jumping jack from Georgia who catapulted to the top with Down In The Boondocks, came across best because he stayed relatively low key. 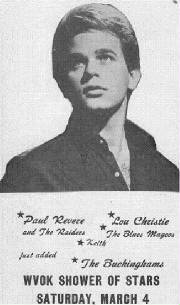 The same cannot be said for Lou Christie. Attired in a hot pink satin shirt and tight while pants, he gyrated all over the stage. His voice alternates between high tenor and screeching soprano, and neither fits him. Mitch Ryder (billed as the original Sock It To Me boy) and his review socked it to everyone in the audience and vice versa. Oddly enough, except for the Sock It To Me number he remained rather cool and aloof audience wise. The kids were yelling at him but he appeared to be singing only to himself. The finale came with Paul Revere and the Raiders. While it is unfair to comment on lead singer Mark Lindsays ability (you couldnt hear for the music) the by play between the performers was very entertaining. The only question the show left in the mind is whether any of these people could make it by just standing still and singing. The Buckinghams were greeted with loud cheering by a sellout crowd, as they opened the WVOK Shower of Stars Show Saturday night at Birmingham Municipal Auditorium. The audience of very young to collegiate youngsters greeted all the acts with obvious enthusiasm from first set to final chord, and with reason. It was a well-planned and varied program with most of the popular sounds of the day ably represented. Billy Joe Royal as unaffected as ever, but now elegantly mustached and backed by his own excellent seven-piece band, has matured musically in a very short while. His style and program is directed toward general audiences rather than the bubblegum group that had been his specialty. His performance of Spinning Wheel was good. Saturday, as always, he was besieged by pleading hands, adoring cries, a snowstorm of billet-doux and little gifts by his fans. BOBBY SHERMAN, who followed Billy Joe, lacks the latters well developed talent but the charisma of his TV character surrounds him wherever he goes. He flexed his knees, slapped his feet and kept the fringe on his suede vest in constant motion while running through his repertoire, flashing the peace symbol, constantly as he spun through a lightweight Aquarius. Evie Sands, a tiny girl who was almost out weighed by her big electric guitar, has a voice suited to the rhythm and blues numbers she prefers. As for Kenny Rogers and The First Edition, they were superb. Their sound on stage is as fine as on record, each of the four singer musicians displaying a technical efficiency retained from the days when they were the New Christy Minstrels. Their style now is a pleasant hybrid of rock and ballad blues, and the nights program was drawn almost directly from the series of hits they have enjoyed during the past few years. Kenny Rogers, sans glasses, was the dominant figure as he took the lead in Ruby and Reuben James. Perhaps one of the best numbers in their set was Elvira, a fresh new version of an old Dallas Frazier screamer. THEN came The Grassroots, a musically complex group that just cant be placed into any one category. It is an extremely talented foursome who play with an incredible amount of energy, style and high good humor. During their time on stage they exercised an almost hypnotic control over the audience. The final jam was so exciting it even eclipsed the act that was to follow, Canned Heat! The group came on like a group of musical renegades to close the show with a program of really heavy rock that spotlighted their really heavy singer, Bear Hite. Concert? Event? Happening? 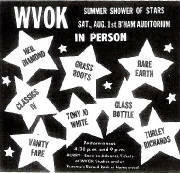 Whatever it was, the WVOK Shower of Stars Saturday night at the Auditorium got off to a rousing start and ended in the same way. A standing-room only crowd welcomed the first act, Tony Joe White, whose style, on stage and off, is always warm, intimate, friendly and unpretentious, and whose repertoire included favorites like Polk Salad Annie. THE AUDIENCE was prepared to love everything and they did, continually applauding, shouting, sending gifts, flowers, and notes flying across the footlights. Certainly the evening featured something for everybody, hard rock, soulful ballads, country flavor and good time music. There was the Frijid Pink, an enormously talented group who numbered an Alabama boy, Satch Harris, among its members, presenting its version of the new Detroit sound which has begun to permeate the country. There was Michael Parks of TV fame, nonchalantly yodeling, chanting and singing in a manner directly contrasting with the spirited and constantly moving, rock stars. THERE WAS the Guess Who, solid musicians who had none of that were so hip we dont care about the audience condescension sometimes unique and well polished music which is highly commercial as well as entertaining. As for the Grass Roots, they were as always, instant favorites with the crowd. They seem to structure their performance, pyramiding their act so that at the end of their set they have given everything to their audience, and achieved total rapport. April 18 marked the anniversary of the original Paul Revere ride, so it was particularly appropriate that his name sakes should be riding high in Birmingham Saturday night. The Raiders blossomed into a ten-piece band for this evening, with horns and Phil Volk (of the now defunct Brotherhood) adding their sounds to the spirited set. Each rendition by the groups stars...Freddy Weller and Mark Lindsay in particular, were received with unmitigated enthusiasm. The evening ended all too soon for the packed house who reluctantly pushed their way through block long lines waiting their turn to enjoy an exciting spring rock spectacle. Every song, every act seemed to meet the approval of the sell-out crowd at the Birmingham Municipal Auditorium Saturday night when WVOK presented its Summer Shower of Stars. It was a time to meet new groups, welcome old favorites and to hear rock a ballads and fiery intricate sets. Opening was The Glass Bottle, a wise choice, for its cheerful sounds and easy manner set the pace for the evening. By contrast there was Turley Richards, with his soulful screaming, gospelly sound solo in a white spotlight whipping up songs in an emotion filled voice. Vanity Fare was the only import of the evening. The Britishers, with two big single hits under their belt displayed musical agility in a polished performance. AGAIN A CHANGE of pace with Tony Joe White and his warm and gutsy music, so relaxed you would think he would ooze off stage, yet whomping up all manner of mighty wonderful sounds. Tony is a superb and sensitive guitarist, with a totally winning and natural delivery. And the program was only halfway done. Rare Earth, the heaviest group of the evening, presented an extended version of Are You Ready, proving that theirs is not a studio sound. This excursion into hard rock was enough to convince everyone that the group was not afraid to improvise or use repetition to build intensity. There were new members in the Classics IV but the switch was all for the good. They played straight ahead, down the line rock and roll with Dennis Yost singing his best by request numbers. The Grassroots (now five instead of four) cannot be outdone for sheer hard work. Their exuberant cavorting around on stage does not inhibit their fine and funky sound, or impede their expert musicianship. They remain one of the finest performing rock groups in the business. Neil Diamond was Neil Diamond and who can ask for more. He brought a three man backup group with him, and they were all attuned to the highest peak of empathy. Neils songs, largely his own, were at all times exciting and all of eloquent voicings. The back stopping group gave him excellent support as he sang many of the requests tossed to him by a responsive and appreciative audience. WVOKs Fall Shower of Stars Saturday night brought a grand array of groups and super groups to the stage of the Birmingham Municipal Auditorium. A sell out crowd welcomed the performers with uninhibited enthusiasm. A powerful sound system, especially installed for the occasion, carried the music to every corner of the auditorium. This was most advantageous to the groups with softer sounds, but resulted in distortions that somewhat blurred the effect of more aggressive ones. Dawn, a New York group whose expertise belied the fact that they have only played together since summer, came on in a harder, heavier style than their recordings indicate, even in their hit Candida, and new single Knock Three Times. Michael Nesmith has assembled an extremely professional group with his First National Band. He seemed far more relaxed, confident and happy than when cavorting with the Monkees. His manner was friendly and folksy with a familiar Nashville twang. His voice was simple and melodic, like his songs. He and his group indulged in no frenzied displays of showmanship. With a little help from his friends (one of whom was a super fine steel guitarist) he made his set one of the most entertaining of the evening. Tony Joe White, rangy Cajun with swamp band music growled out his particular brand of rock-country-soul that no one successfully imitates. This cool boy from the bayous has a talent for translating things he knows and stories hes heard into unique songs. This, combined with rare musical abilities, make him a welcome and distinctive addition to any show. The First Edition was back, having shed Edwardian elegance for durable denims, and added an organist, John Hobbs. Kenny Rogers led the group through numbers that ranged from its early (and perhaps only) real rock and roll song, Condition, to its message music, Somethings Burning, and Ruby. Also returning were the Grass Roots. Their set was as professional and aggressive as ever, but this time, it seemed repetitious and even monotonous. Maybe its time they tried a little innovation. Even a good thing can go stale. HIGHPOINT of the evening was the appearance of The Carpenters. They are sensationally good, in person, as on recordings, their stage sounds as impressive as those from the studio! Richard Carpenter, leader of the group, is also the electro-piano player and arranger for the fine quintet. Karen, his sister, a small girl with a plaintive face and lovely voice, plays drums and sings the lead. In addition to Karens solo, the group offers four-part singing that results in some of the finest harmonies any group can muster. Their arrangements are imaginative and often romantic as they merge rock and jazz sounds. 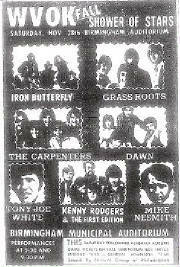 The Iron Butterfly, with the help of twenty mikes and a fantastic sound system, did the thing they do best...hard, heavy, progressive rock, turning on the raw and powerful, sounds that have made them famous. They were gracious, charming and hard working, and their impact on the audience was justified. 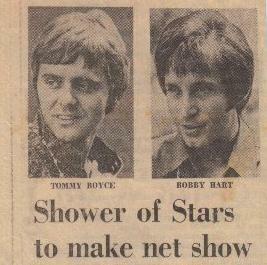 Tommy Boyce and Bobby Hart, two of the stars appearing in Birmingham on WVOKs Summer Shower of Stars have been signed for their own weekly network television series that will take to the tube this fall. This full hour program features Tommy and Bobby with guest entertainers and talks with young people drawn from every section of the country. In connection with this show, Screen Gems, producer of the new Boyce and Hart show, will bring a color TV crew to Alabama to film a portion of the WVOK show at the Municipal Auditorium on July 26. A portion of the Shower of Stars program will be presented on the opening segment of the new TV series. Screen Gems announced that they had chosen Alabama for this kick off film because of the appreciation and enthusiasm shown by Birmingham audiences for pop music, and because it represent the type of good lively but wholesome entertainment they want to feature on the show. This TV show is just one phase of the multimillion-dollar agreement involving three companies with the Columbia Pictures Industries and Boyce and Hart.